Rockets are cool. These rockets, however, are not part of Rocket Internet. Nor are they Internet rockets, aimed into space to bolster connectivity. Rocket Internet is back in the news, which means you and I have some work to do. As a collective, Rocket Internet is among the most interesting technology plays in the market today. 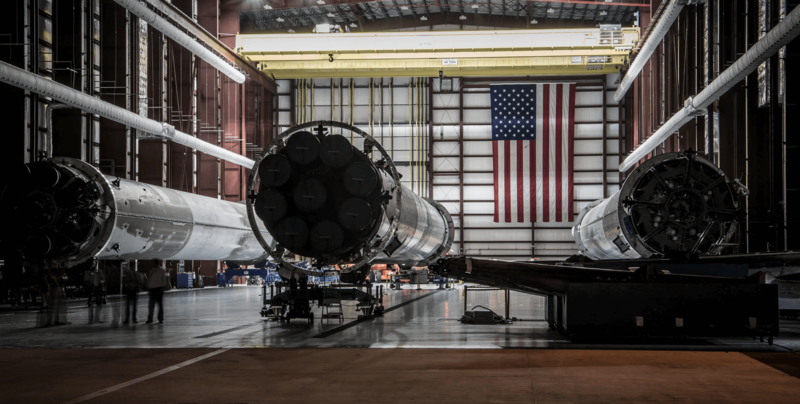 Predicated on a model that sees it clone, copy, and launch rival startups to compete with international successes, Rocket is public, granting us an inside view into the performance of its machine shop of dreams. Lately, however, its shares have been on under pressure as its results have rolled in. Can you build startups en masse? Can you take veterans and external ideas and launch a string of hits? Let see. In late 2014, Rocket Internet went public at the upper end of its range, raising around $2 billion at 42.50 Euro per share. The company was worth, according to Bloomberg at the time, 6.7 billion Euros. Today, using data from Yahoo Finance, Rocket Internet is worth less than half at $3.27 billion. At one point, the company’s shares traded for more than their IPO price, making its declines sharper than they might seem when only considering the price at which it originally listed. The firm has undergone a number of corrections this year, including a sharp fall in January and another heading into May. The first came around the time the company raised a $420 million fund to invest in startups, into which Rocket Internet placed $50 million. The group’s shares plunged 14 per cent last month after it cut the valuation of Global Fashion Group, one of its ecommerce companies, by two-thirds to €1bn. 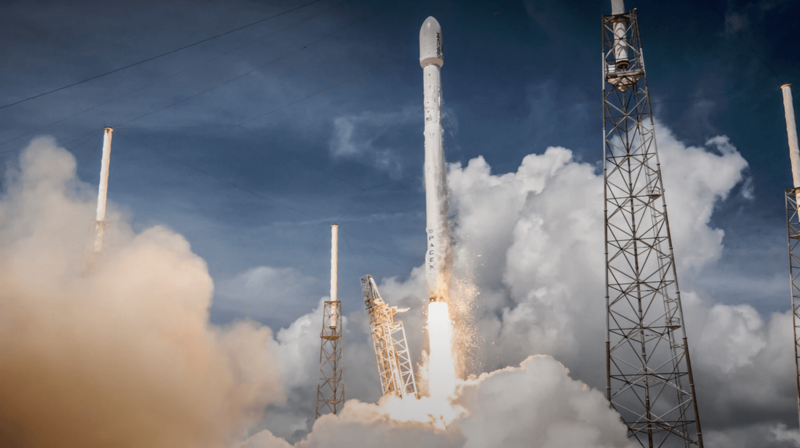 Concerns that Rocket had fallen out with one of its biggest shareholders, the Swedish investment group Kinnevik, only intensified the market jitters. How every IPO pictures itself. Missing from image: Same shot, 2 years later. If things were looking up, why didn’t shares in Rocket Internet buck up and head back towards their IPO price? Why Did $RKET Get $REKT? The Q1 report only had good news of a sort. [S]elected portfolio companies have made significant progress on their path to profitability in the first three months of the year. 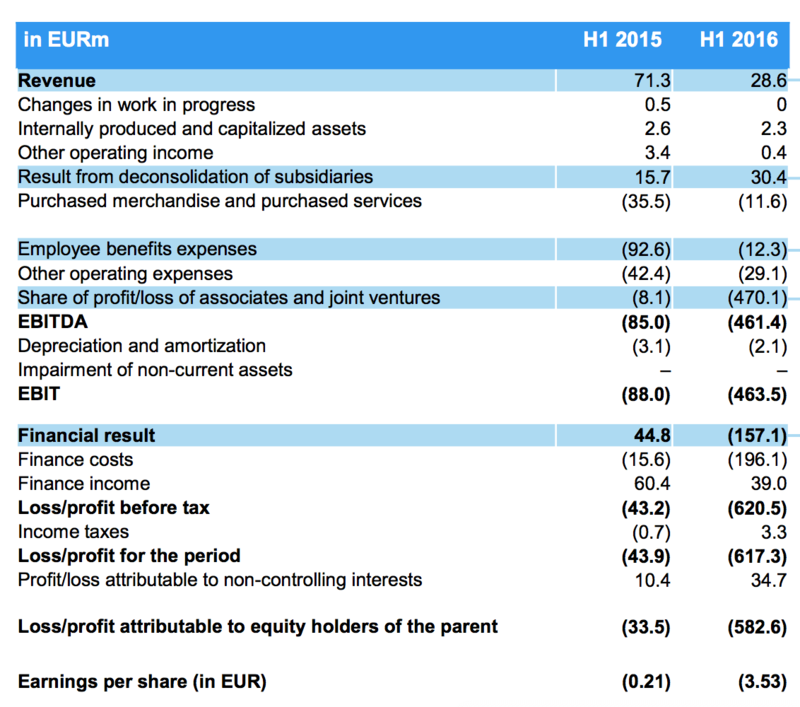 The adjusted EBITDA margin improved by 16 percentage points to negative 22% in the first quarter 2016 compared to the first quarter 2015, thereby reducing absolute EBITDA losses by more than EUR 40 million. That’s not very good. Huge writedowns and falling revenue mean that the top and bottom lines were under synchronized assault. The final H1 results came a few weeks later in September, bringing with them an abundance of lessons. Rocket announced that its “aggregate adjusted EBITDA margin improved from -32% in the first half of 2015 to -17% in the first half of 2016.” Continuing the theme of contoured reporting, Rocket went on to say that “absolute EBITDA losses decreased by EUR 84 million” during the period. You can read that chart either generously or not. 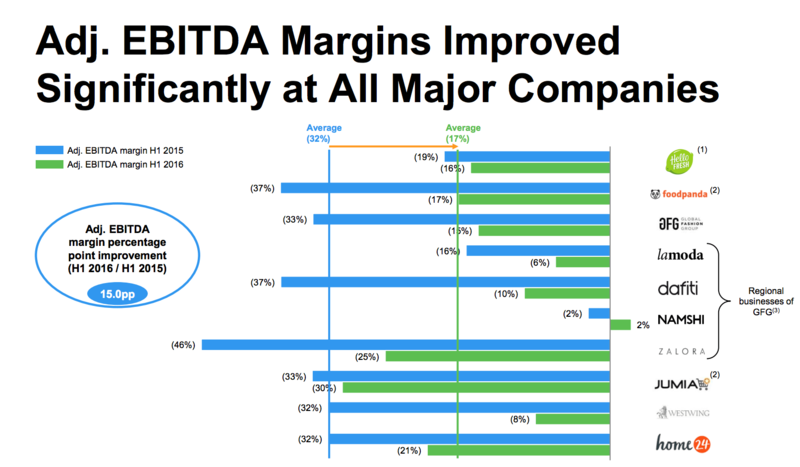 If we do so generously, one of Rocket’s companies is finally adjusted EBIDTA profitable!2 And margins look dramatically better at a number of its companies! 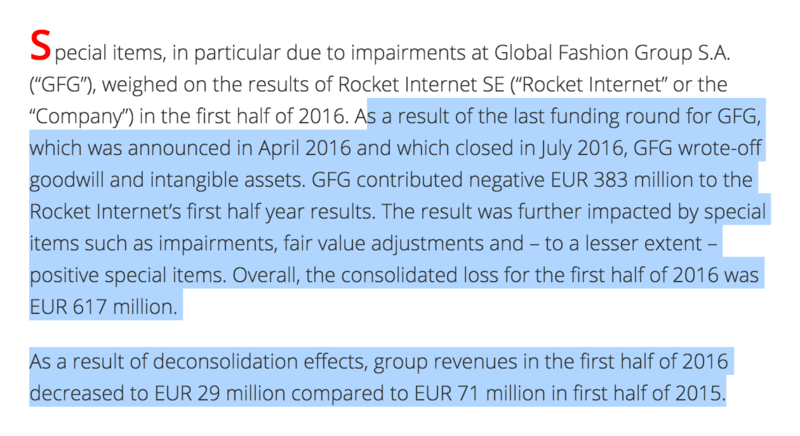 While this is correct, Rocket still lost over 200 million Euro on an adjusted EBIDTA basis in the half. That’s very, very steep for a mid-year deficit. If we were to judge the firm on a GAAP basis, the red ink would be an even deeper pool, I suspect. Did you just stare at that chart and have no idea where to begin? Mattermark is here to help. Do what every financial dork does first. Find the revenue line that is pertinent to the period in question, which is, in this case, the first half of 2106. Then compare it to the final loss/profit line that you can. Is the loss number bigger than the revenue number? If so, that’s super bad! So we are going to move towards a conclusion. The piece goes on to detail a company that is “much better at launching companies than actually running them,” noting that “HelloFresh, a grocery-box delivery business and Rocket’s single-largest investment, saw growth stutter in the second quarter and losses more than double” in the period. Today, I’ve done my best to avoid the complicated operating and investment structure of Rocket Internet, which takes a bit of explanation past what you already know about other startups. However, the takeaway is simple: It’s hard to build a single company. It’s super hard to build two, let alone two at a time. Rocket is trying to bet that it can do even more than that, while making money in the process (eventually). For now, the company has shown shrinking continuing losses on the back of massive tallied deficits. If that is enough for investors remains to be seen. Rocket went public when things were frothier. Now, froth has lost basis points, and Rocket has to prove that it hasn’t lost its point for being. It can do so by turning a profit. The company did not respond to a note from Mattermark concerning its ramp to profitability by the time of publication. That means it’s still not profitable. It’s like GAAP, but on holiday in Europe.